There's a new slots game at Intertops Casino! 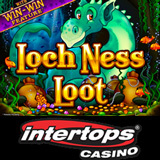 In the new Loch Ness Loot slots game at Intertops Casino, there’s a hidden trove of treasure waiting to be discovered in the murky waters of a mysterious Scottish lake. Loch Ness Loot is a 25 payline slots game with haunting bagpipes playing in the background as sensational newspaper headlines, paparazzi cameras and snapshots of the illusive Loch Ness Monster spin on the deluxe game’s five reels. The adorable “Lochie” is Wild. A golden underwater treasure is the Scatter and scatter wins are multiplied by total bet. Three or more Treasure scatter symbols left to right trigger the bonus feature – eight free games where prizes are doubled. Randomly triggered progressive jackpots can be won at the end of any game. Loch Ness Loot also offers the unique Win-Win feature that multiplies even the smallest feature win into a prize worthy of capturing on film. Win-Win comes to the rescue with a Bonus prize up to 150x the bet for players that don’t do well enough during their free game. The Win-Win feature is also available on other top games including the new The Three Stooges II slots game. A video version of this story and other slots news is available on the Online Slots News channel on YouTube.